Even though NYFW brings out the best of Fall fashion, it’s actually still Summer until 9/22. To commemorate an awesome summer, I wanted to formally say goodbye with this collab that I did with my booski ShaKera of The Real Sample Size. While out in ATL, her photographer extraordinaire Alfred from Charis Solutions Photography took some amazing photo’s of us enjoying the fun in the sun. If you are in the Houston area, definitely hit him up, you will not be disappointed. Sunshine calls for a great print. I went with the strapless jumpsuit, because if you haven’t noticed, I’ve been living in jumpsuits all summer. Since the jumpsuit was the perfect length on my short frame of 5’5”, I was able to pair the jumpsuit with the Darcy floral sandal. Throughout the summer, I received tons of compliments on these. Rocking metallic footwear is an easy way to tie your whole look together without having to go with traditional black. ShaKera went with an asymmetrical skirt in the same print with a flutter sleeve tee. As a tee shirt addict, I like the flutter sleeve for a fun update on a classic piece. This should definitely come in more colors cause you can wear this tee all year long. A heel lover, ShaKera went with her oldie but goodie’s from Steve Madden. I will say I did a lot this summer. I tried a bunch of new restaurants with the bf. Tried Haitian food for the first time. Was honored as Blogger of the Year alongside the IG Wives from Full Figured Fashion Week. Got to see the wonders of black beauty at Curlfest. Went to the TCF Style Expo in ATL for the 2nd year in a row and (and bought a lot of tee’s). Danced the night away at my best friends birthday party. Went to a BBQ. Supported my boyfriend by going to his basketball games to watch him coach. Sat outside and just let the sun shine on face. I laughed, I rested, and I shopped. I did everything but dip my toes in some sand. All and all, I had a great summer. 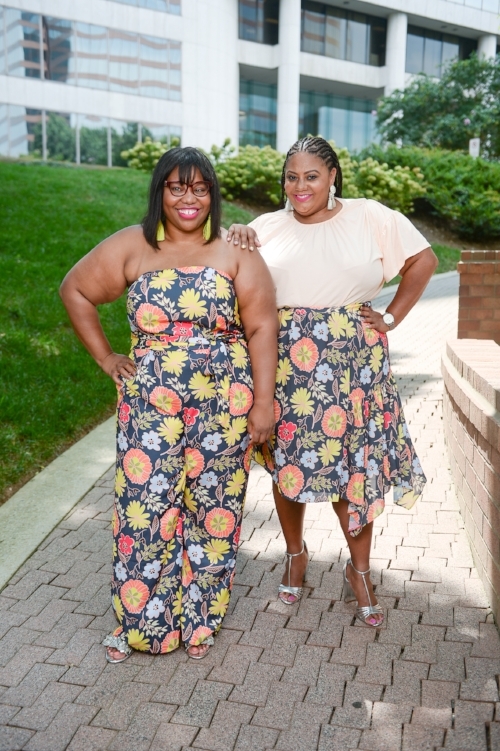 I feel like summer ended at a cool note by attending Textures on the Runway and Curvy Con. BTW these pictures capture me and ShaKera perfectly. Laughs and more laughs. No you know I love trying new items, especially when it comes to beauty & tech, and this combines my love of both. This toothbrush right here definitely needs to be shared with everyone. No seriously, this toothbrush is a game changer. Smile Brilliant- the company that has created the perfect at home whitening system, now has an ultrasonic electric toothbrush. The cariPro electric toothbrush kit comes with two premium brush heads made with Dupont bristles and built in tongue scrapers (because you should never neglect your tongue), and a charging base. Where most electric toothbrushes just come with one setting, the cariPro has five. I’ve tried all of them all, and the great thing is that you can use multiple modes to customize your desired cleaning experience. White has a stronger pulse than Clean Mode to get your teeth the whitest. Massage gives your mouth a nice massage, I use this after I’m done with clean & white mode. Gum Care provides cleaning along the gum line. Healthy gums, healthy teeth, healthy mouth! Sensitive is great for my sensitive teeth lovers. It still leaves your mouth clean but it’s easier on the teeth and gums. I’ve been trying it for a week and I do notice that my teeth are whiter and overall my mouth feels cleaner each and every time I use it. Starting at $119 it’s a great and affordable item that will last. You know sharing is caring, so I have a chance for you to win one of your own! All you have to do, is click here and you can win one for yourself!!! Can't believe how fast the TCF Style Expo came and went!! I am definitely going to do a roundup of the vendors I visited, goodies I bought, and share the runway action, but I received so many inquiries on what I wore, that I wanted to share this asap! I have been creating my own suiting of sorts, and this bomber/pant situation from Lane Bryant was the perfect look for Day 1. I fell immediately for these wide leg pants. I love the Allie fit, they just work for my body type. The wide waistband stays in place and accentuates my waist, and the length is perfect for my 5'5" frame. In the Allie I wear a size 18 which gives me enough room in the thighs without having a gaping waistband. For a fun twist, the matching jacket wasn't a blazer but a bomber. I am wearing a 18/20. Has anyone checked out Target's New Brand Wild Fable? If not, you should. It's an ode to all things 90's and I feel that there are pieces out there that a myriad of people would like. What's also great is that the brand carries plus and most of the plus is in stores! A couple week's back I tried on some pieces on my Instastories (are you following me on IG, if not, you need to). One of the items I picked up was this cute striped crop top. I am wearing a 2X, and its a great fit. Comfy, and stretchy! When it comes to florals, I always like to mix in some stripes or polka dots to keep it fun. It's also a very chic and easy way to mix prints. To finish out my look I went with my Steve Madden Debbie block heel shoes and my Fossil Finley bag. When walking around an expo, I went with a pair of shoes that I can wear for several hours without wanting to throw them out and run away in the other direction. Any shoe that I can wear for more than 5 hours is a keeper in my opinion. I wanted an easy going bag that can hold all my essentials without being bulky, and my Fossil Finley bag was perfect for the weekend. Cute, and comfy is the goal while checking out panels and talking it up to the vendors. For the party to celebrate Marie's 10 Year Anniversary, I rocked a cute pink maxi dress from Eloquii (which is on sale, so check it out before it's all gone). For the last day of the expo, I went with another suit, this time from Premme. I've had this suit in my closet since it launched earlier this summer, but I was waiting for the perfect time to wear it. The expo was it. This is sold out, but they should be dropping some new items completely worthy of being in your closet. With the suit being a pink plaid- a'la Cher from Clueless, I thought it would be cool to wear a mesh tee from Simply Be and matching bra from Elomi. Elomi is one of my go to brands for bras. They make beautiful bras that accommodate a large bust. I am a 38K in their bra's so finding something that provides comfort, support, and looks great will keep me as a repeat customer. The Anushka is a pretty pink and black lace bra. This style comes in a plunge style, but plunge bra's are not my speed so I am wearing the version that is more of a full coverage. I ended my look with some sneakers to give it a cool girl vibe. These are the Nike Blazer and I must say that they are the lightest, comfortable sneaker I own. Since I was running back and forth between panels and talking to vendors, these sneakers definitely came in handy. Now that my #ootd's are out of the way, stay tuned to my recap of the expo, and 3 reasons why you need to attend! Later lovers!! If you are following me on IG and checking out my stories, you will see that I have been obsessed with jumpsuits all summer. I just love how its an easy way to look super chic without a lot of effort. Between rompers and jumpsuits, I have been rocking them hard whether it's to the office or hanging out on the weekends. When this jumpsuit popped up on the site, I had to have her. I love denim, so any opportunity to rock denim outside of the traditional jean, I'm down. Outside of chambray, I rarely wear denim in the summer due to NYC humidity, but this jumpsuit had me not thinking about the humidity and thinking of how cute it's going to look. When I received this jumpsuit in the mail, I loved that it was nice medium weight denim that was stretchy. I like medium weight denim since it hardly wrinkles. Chambray easily wrinkles, and I want to say that it's attributed due to the lack of lycra. Also having a jumpsuit with stretch just allows for way more ease of movement. Since I was going to be in the park all day, I kept it simple with these rainbow slides from J Crew. I have amassed quite a bit of a collection this summer, and I am not in the least bit shamed about it. I have wide feet, so I sized up to a 9 versus my normal 8.5 medium shoes to ensure that I have enough room across my foot. The Cora sandal comes in other colors, so if the rainbow is not for you, there are other options and the best part they are all on sale. My jumpsuit collection has skyrocketed this year. There has been so many cute options, that I just could not pass them up. I linked some of my favorites from Eloquii below, so let me know if you have indulged in some jumpsuit love too. I had a great time at Curlfest. It felt good to catch up with the blogger boo's, get some cute new wraps and check out all the new hair products. Even bf got him some cool items from the Shea Moisture booth. I really hope they do something about the reception in the park cause so many of my friends were there and I couldn't find them cause literally my phone said "No Service". Regardless of that, I am looking forward to seeing it continue to grow. So many of my friends loved what they were able to see on my IG Stories that they are going to come next year. Hmm, I guess this means I gotta do some serious planning- maybe a cool tent, and a grill- we shall see. My younger self would tell you suits are terrible and boring. They are for bank managers, and government officials. Now in my thirties, I view suits in a completely different way. They can mean business, but you can also have fun with them. There is no wrong way to wear a suit these days, and I am proving it by rocking an all white suit in a fun casual way. I am a blazer addict- they are a great way to spruce up a look without a lot of effort. I am wearing a tee shirt and shorts, but the blazer pulls everything together and makes it chic. The Bryant blazer from Lane Bryant has been my go to this year. They have made several different versions (ponte, lace sleeves, off the shoulder), and the fit it perfect. I wear a 18 or 20 in blazers due to my arms and chest, and these give you the room to move around. Nothing worse than feeling restrictive in your blazer. Since this one is lined, I went with a 20. I love the nautical vibes with the gold buttons. Even though this blazer is white, you will definitely see me in it way after summer is through. Suits can be fun just by adding items with cool detail, like these Allie Scallop Shorts. Suits can read serious, but with pairing the blazer with shorts with cool detailing it makes it casual. I have been a fan of the Allie since their debut last fall, and with them adding new silhouette's, there is an Allie for everyone. The waist band prevents gapping, and these are one of the most comfortable shorts I own. Wearing shorts this length for me was a no no when I was younger, but I am at a point in my life that why should I not wear something I like cause of what someone might say. These are my thighs, and these thick thighs are enjoying their summer in shorts, dresses, and whatever else I want. My collection of graphic tee's continue to grow with the addition of the Etoile tee from Asos. Etoile means star in French, and I feel quite Parisian in this outfit with my red lip and cool shades. Asos has so many cool items, and the Daisy Street brand has some gems. I ended out my look with my new sneaker of the summer, all white Nike Blazer low tops. My summer sneaker for the past two summers has been the Adidas Stan Smith, but when I went to get a new pair, they were sold out in my size. So when I was browsing Footlocker for another white sneaker these popped up on sale. They are extremely lightweight and they are very comfortable. Just to avoid a sold out situation, I may buy another pair for next summer...lol. So lover's what do you think of my casual summer time look?